Aberdeenshire couple, Sandy Matheson and Kirstie Nisbet share more than a love of the great outdoors and the mountain air. Together, they create the wonderful Granite North Gin. Indeed, it was while Sandy was adventuring through the Rothiemurchuds Forest, an ancient pine forest at the north end of the Lairg Ghru, a creative spark formed in his head, which became Granite North Gin. 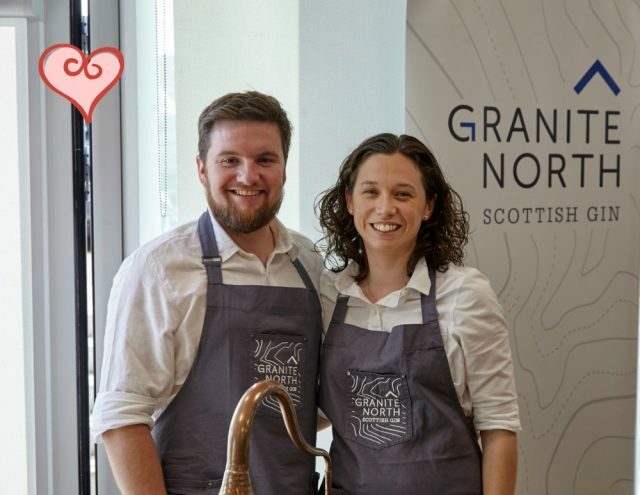 Sandy’s determination combined with Kirstie’s impeccable palate and a joint passion for gin-making brought the gin to market and not much more than a year on, Granite North is going from strength to strength. The couple are currently working on a new Aberdeen city-centre distillery, with the aim to bring their gin-making process home to the Granite City. We caught up with Kirstie to find out a bit more about the couple behind the gin. How did your joint gin journey start? The first time Sandy cooked me dinner (well, ordered a dominoes) he proudly showed off his collection of craft gin, that took up most of his kitchen. Until then I hadn’t really appreciated how fantastic craft gin was. I never thought that several years later, that would be the very kitchen that Granite North would be created in. We love to spend time outdoors, walking in the Cairngorms or cycling around Aberdeenshire, We also love cosy nights in together in front of the fire with a film and a gin in hand! Bottling batch 10 then maybe a few drinks in Bar 99, back to where it all started!